Dynamics 365 is unified Customer Relationship Management [CRM] system and Enterprise Resource Management [ERP] system by Microsoft. This article will primarily discuss the Dynamics 365 CRM offering. This offering can be installed on premises which means your company purchased the software product and plans to install it in their data center(s) on a computing environment that they manage, on their servers and using their own database. The cloud or online offering is much more popular these days and is essentially offered as a SaaS Software as a Service. Microsoft maintains and manages the computing environment and for a subscription fee each month, you have the rights to use the suite. There are two subscription packages 1) Enterprise and 2) Business Central. Enterprise is an all you can eat offering for larger companies. CRM products like SalesForce, Sugar and Dynamics are all essentially databases comprised of well know entities. An entity is a grouping of fields or in database terms a table. The grouping of tables together for Subject Area Views. Because CRM software developers understand the Sales process, they have generated and combined all of the needed entities to keep track of sales, product and customers etc., thus saving you the time and effort to do it from scratch. Sales – Sales is the most well known and utilized App. The feature and functions of the Sales support organizations trying to adhere to and track the sales process. 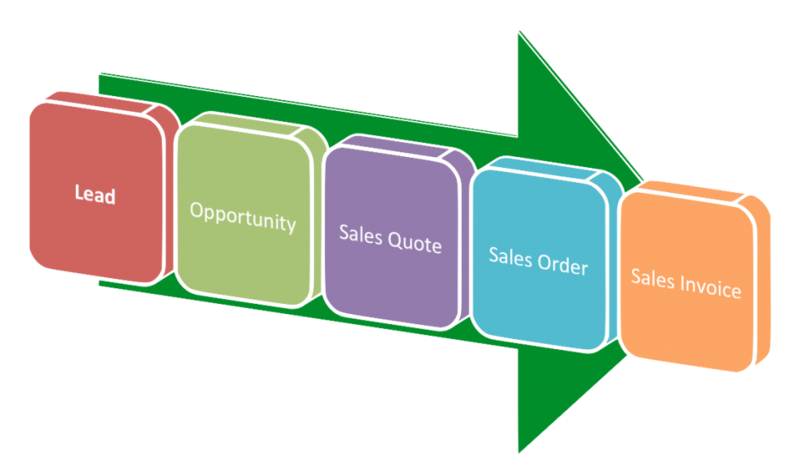 The sales process is usually comprised of the following steps. Customer Service – Functions that support working with customers and service tickets. Field Services – organizations the dispatch representatives in the fields would benefit from this app. It tracks work orders, tickets and all customer interactions. Project Service Automation – Enables the tracking of project, their budgets, schedules, timesheets, etc..
Marketing – Marketing is not included in Business Central package . It permits running campaigns and tracking and converting leads into contacts and opportunities. Lead: someone shows interest in the product or services. They have not been qualified. For example I could show interest in purchasing a LearJet 75. Look it up, its sweet. But I do not qualify to purchase one for lack of income, maybe one day. Opportunity: Once a lead is “Qualified” (ready, and able) to make a purchase they are said to be converted to an opportunity. It is in this phase that we also start to refer to the Lead as a Contact. Quote: If a Lead is qualified then they should be sent a Quote. A Quote is a light contract that defines prices and some terms. It is usually valid for a specified period of time. Dynamics can generate quotes from the information you provide and output clean looking quotes that can be emailed to clients. Order: A signed Quote is said to be a sales order. A Sales order can be compared to a business handshake which agrees that the Quote that was sent is acceptable by the contact (person that was once a lead, and now a contact) that now becomes a Customer. Someone that went through the sales processed and purchased something. Invoice: An Invoice is a request for payment once a product or service was delivered. It is particularly interested that the sales process does not stop here. This is just a brief overview about the terms in the sales process. There are a bunch of steps to foster a relationship with your now Lead turned into a Customer. A CRM helps to track and at times automate the process of fostering the relationship with the customer. As you should know it is far less expensive to get a current customer to buy additional good and services than it is to acquire a new Lead and turn them into a Customer. In a future post I will discuss other apps that comprise Microsoft Dynamics. If you have any questions, please feel free to call me to discuss. All my initial consultations are free and I love to discuss topics that help people conduct business smoother.